When you’re doing highly detailed photographic work, you ideally, don’t want the details of the image to be clouded when it’s printed out on paper. So although inkjet glossy photo paper is the most common choice for photographs, premium matte photo paper could be more practical. With matte photo paper, the images will most likely appear sharper and more defined and the details will really pop. Colors will also be more vibrant. So if you’re working on color photography and really want to capture the reality of the image and every detail in true form, you would be better off sticking with a matte photo paper like Inkpress Linen Matte. The linen matte has the non-reflective qualities you want, but with enough texture to give it a unique yet professional feel. In addition, its texture is subtle enough that it doesn’t affect image quality at all. For enlargements or reprinting, this paper is truly the best option. The images will still look bolder and sharper, even when blown up to a larger size. 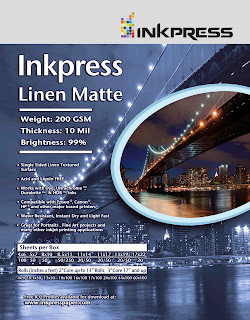 For the best selection of premium matte photo paper, including Inkpress Linen Matte, be sure to visit Photopaperplus.com!